My N Scale kit for Electro Motive Division’s DD35 locomotive uses Bachmann’s massive EMD DDA40X chassis, after some shortening. But as there’s something not quite right about the pilot on the Bachmann model, in this post I will share with you my designs to add a new body-mounted pilot to the DD35. All of the real EMD ‘DD’ locomotives use four axle trucks which rotate under the chassis. 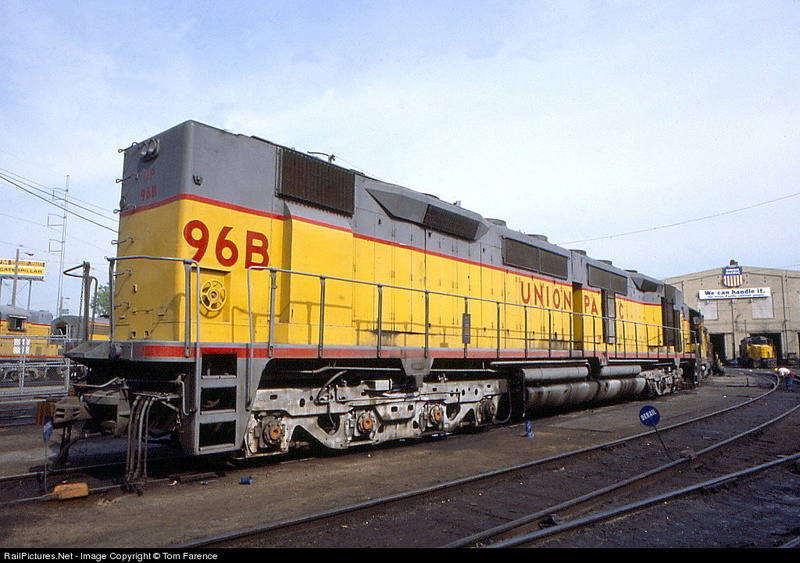 The pilot, which holds the coupling and multiple unit connections, is part of the main chassis, or body, of the locomotive. This means that as the locomotive runs around a curve the truck rotates but the pilots remains square to the body. This is done so the load from the coupling is transferred through the chassis and not through the truck mounting. In this image, from Railpictures taken by Tom Farence, you can see the steps and pilot area are square to the body even though the loco is on the bend. Bachmann’s model of the DDA40X has the pilot attached to the truck causing it to swing out from under the body on curves, as you can see below in this image of a DD35 between a GP38 and an SD35. This also creates a gap between the steps and the body which is, and looks, un-prototypical. You can see the steps in the image below disappearing under the shell. So why is the pilot located on the truck? Well Bachmann did it for a good reason. Because the DDA40X locomotive is so long, without the pilots being on the truck it simply wouldn’t be able to navigate the tight curves, which many of us have on our model railroads, without pulling any connected cars off the track. Curves on prototypical railroads have a much larger radius and they don’t suffer from this issue. The Bachmann DDA40X can actually traverse some very tight curves but it does look odd doing it. However there are a few modelers that have the luxury of large minimum radius curves on their layouts and have requested a modification be made to my DD35 kit. Because I already offer the kit in powered and dummy forms using the same shell I didn’t want to created a whole new shell just for this and, luckily, there is a solution. The dummy DD35 kit, as pictured below, comes with 3D printed trucks that include a pilot. The truck and pilot behave in the same manner as the Bachmann one on the powered chassis and have the same appearance so you can run a powered and dummy unit together. By extending the pilot section up to meet the underside of the 3D printed dummy chassis or the Bachmann metal chassis, the new pilot can be fixed directly to the body, leaving the trucks free to rotate. The new pilot section, as pictured below, has been shaped so it will fit the sloping 3D printed dummy chassis or the Bachmann metal chassis, and it has the same mount for a Micro-Trains body mount coupler. The MU hoses are printed as part of the pilot but can easily be cut off with a craft knife or sanded off if you prefer to fit etched brass ones. The new pilots are available in two packs. Please remember when fitting your N Scale DD35 with a body mounted pilot and coupling it will increase the minimum radius that your locomotive can navigate. If you are unsure if this will work for you, position your DD35 over your tightest curve and see where the nose of the body swings out to. If it is outside the sensible condition to be able to couple up to a another car or locomotive then your radius is too small. I will also be making a similar pilot available for the N Scale EMD DDA40X which I’ll share with you soon.